Russ introduced us to technique of brining the turkey after being taught by his Mother-in-law, Maria. When we tried it we found it took turkey to a whole new level of flavour and moistness which is even more noticeable in the leftovers! The first year I tried it for an O’Neil Thanksgiving celebration for about 50 relatives and had a panic attack since you must realize the extra moisture retained by the bird makes the roasting time longer! The 26 pound turkey did not start cooking until the guests were already arriving. Luckily they stayed long enough to enjoy the results. Now we use a simple brine for our chicken and turkey whenever we are roasting it. When I saw a recipe online that brined a turkey breast before barbequing I was on my way to a new favourite that would rival Marg’s pork tenderloin and Dad’s flank steak for a “go to” recipe for family and friends. It is equally appropriate for a week night dinner as it is as a main feature for company but more importantly it is so simple and always delicious. I could not imagine finding another recipe for the new gluten-free cookbook I am working on that would be on that level right down to the added bonus of providing leftovers for lunches that cannot be beat. For our Mother’s Day gathering with family we brined up 3 large turkey breasts and marinated 2 flank steaks and took them to a Mother’s Day gathering for our family where Cliff was able to enjoy one of the first beautiful days of spring while he barbequed and visited! They were so delicious but there was only enough leftover for Grandma and Grandpa today. You do not have to wait for special occasions to enjoy roast turkey for dinner you just need for your local grocer or butcher to have it on the meat counter. Thank you to Knechtel Food Market for having this specialty available so often. I was too busy enjoying the day yesterday to get a good photo of the turkey and sweet potatoes on the BBQ so the photo I have was taken in the middle of winter when Cliff could not reach the BBQ for 4 feet of snow – no problem – this turkey is lovely roasted in a slow oven for several hours too! If you see turkey breast at the grocer my advice is to buy two because you will want to try it again soon! Boil water, salt, sugar and peppercorns together until sugar and salt are dissolved. When brine is cooled to room temperature cover turkey in a plastic bag with liquid and turn to coat. Place in a pan and refrigerate for at least 2 hours and up to 12 hours before cooking. Preheat BBQ to 325 degrees F and place drained turkey breast skin side up on the grill for 45 to 60 minutes until a meat thermometer reaches 150 degrees F.
Turn the breast over and continue to grill for another 10 – 15 minutes until the internal temperature reaches 172 – 180 degrees F.
Remove from grill and let sit at least 10 minutes before slicing. I love to serve this with baked sweet potatoes and homemade cranberrie sauce! 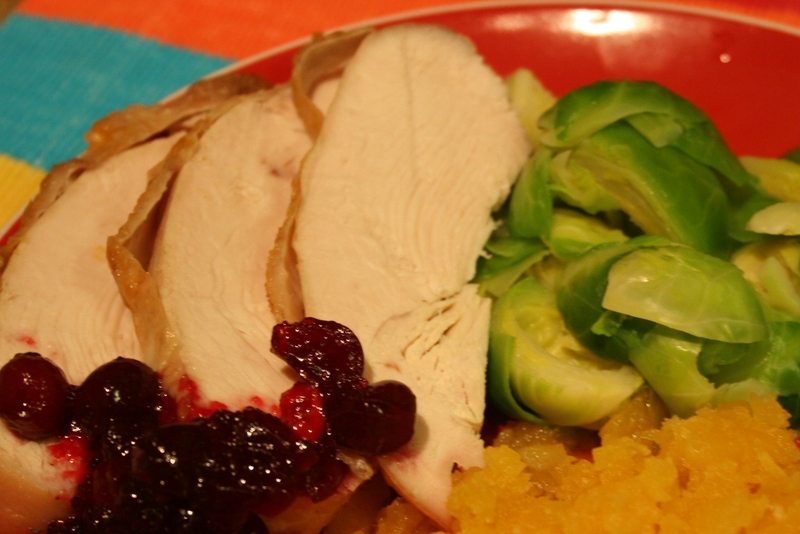 This entry was posted in New Gluten-free Recipes and tagged Anne's Favourites, awesome, BBQ, brined, Delicious, roast turkey, simple, turkey breast, versatile main course by Anne's Favourites. Bookmark the permalink.